Hey there, thank you for reading this. Your curiosity is so weird, and wonderful, and much appreciated 🙂 Below are a few questions I presume you want answers to! 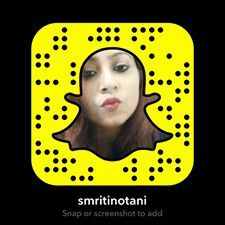 Hi, I’m Smriti Notani! I was born in Bombay many moons ago – yep, I’m at that age when you’d rather do headstands to distract people than tell them your real age when they ask you. So moving on – I’m a writer by profession. I used to work in advertising as a copywriter. But then I realized you couldn’t actually drink in office and none of the men looked like Jon Hamm from Mad Men, so I quit. Then I started writing for different blogs and websites, and quite enjoyed it. Honestly, there’s been no looking back since! You can go check out (some of) my work at Popxo, Popxo Weddings, InOnIt, Spicy Sangria, MissMalini, MumbaiMag. I also freelance as a copywriter and take up projects with various small agencies. Okay, my shameless self promotion has ended. Hey, to be fair – you asked! What kind of blog is Real Girl? Well I guess the most apt (and non-committal) way to slot it would be a lifestyle blog! So will it not have topics like beauty and fashion? While it can’t be slotted as a beauty or fashion blog, it will still have elements of both. Because truth be told – any real girl does care about these two aspects. Tell me if you disagree, but they do form a part of my day. I do get upset when my eyebrows are not on fleek. I do care if my outfit is not on point. So to conclude, it will in fact have topics like beauty and fashion and all other girly things we girls care about. Secondly, contact me no. I’m damn friendly and all – I swear. I’d love to respond to anything you have to say.